After viewing the amazing Cross slabs at Rosenallis, I took the short journey to visit the 7th century slabs at Clonaslee. 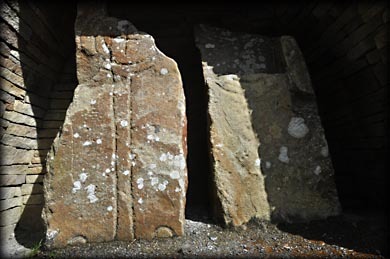 The sandstone slabs were moved to here from Carrigeen graveyard, 7 kilometres to the west. There were originally three slabs, but one of them is now missing. 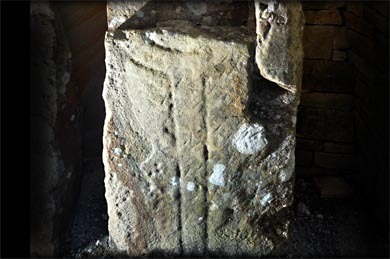 The two slabs bear simple incised crosses with a double lined circle at the head. Sadly the top of each slab has been broken away. I was delighted to see they have finally been given some sort of protection against the elements. Situated: On the grounds of St Manman's Catholic Church in Clonaslee. From Mountmellick take the R 422 west for 15 kilometres. In Clonaslee take a right turn for Tullamore. The church is hidden behind a grey archway on your left. Discovery Map 54: N 3172 1114. Last visit Mar 2018.